The Haag Streit BX900 is recognized throughout the world for it’s precision biomicroscope for taking images of the anterior segment of the eye. 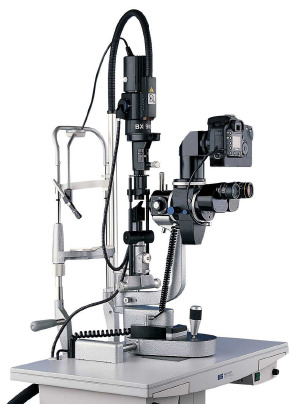 Haag-Streit BX 900® slit lamp combines imaging technology with optical brilliance to capture the correct image needed to monitor your eye health condition. This is important to monitor progression and associated treatment needed to resolve any eye conditions. All imaging captured is integrated into our medical records so that the images are easily available for access to referring MD s when warrantied. We take pride in providing this level of care along with the eye care community. Giant Papillary Conjunctivitis, or GPC as it is commonly known, is an inflammatory condition involving the conjunctiva of the human eye. The conjunctiva is the thin slippy tissue that covers the front of the eyes as well as the inside of the eyelid. The hallmark of this condition are small (and sometimes GIANT!) 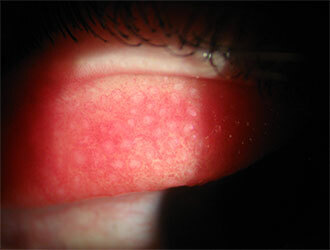 bumps called papillae that form on the underside of the upper eyelid. This is very chronic condition and can range from mild, to moderate to very severe and are found in contact lens wearers. 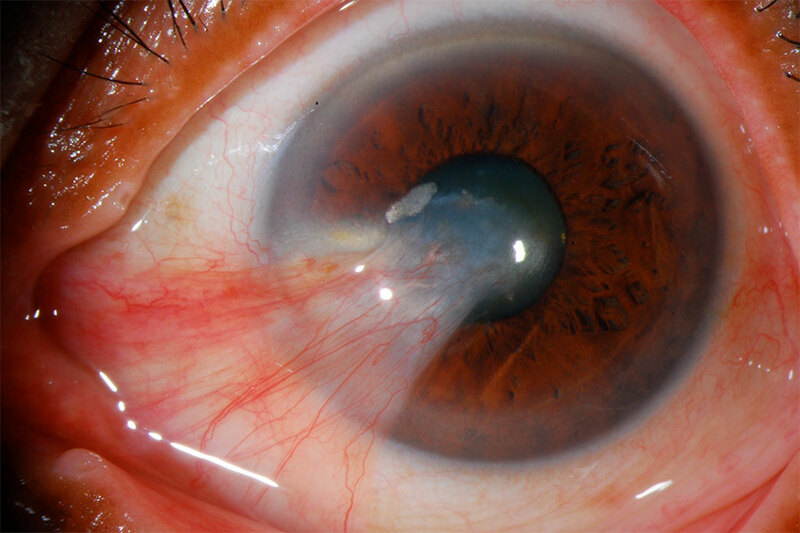 This is a small yellow-white growth that forms on the eye, starting from the white conjunctival skin, and spreading over the clear cornea. These are harmless growths and common in people with sun exposure or who work outside. The conjunctiva is a very thin layer of skin that covers the eye. This skin can become irritated by a lifetime of sun and wind exposure, causing the skin to thicken and grow a little bit … just like chronic irritation will cause the thickening of skin elsewhere on the body such as a callus on the hands or feet. When skin thickening happens on the eye, we call this a pterygium (or pinguecula if the spot is isolated on the conjunctiva only). A pterygium can be aggravating as the eyelid rubs over it with every blink. When irritated, the pterygium can swell, turn red, and cause even more eye irritation. If the pterygium persists, gets larger, or approaches the visual axis, than surgical excision can be considered. 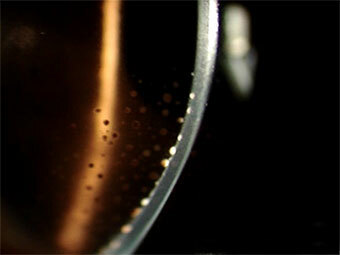 This slit-lamp photo shows KP (also known as keratic precipitates) that form on the inside surface of the cornea in cases of chronic eye inflammation.